While the current garage rock revival has dozens of footholds across the country, few have been as prolific as Chicago. The Windy City's success as such can certainly be measured in quantity, but in the end quality is what matters. This summer local fuzz-poppers The Bingers offered up the Land Lobster EP, a more than worthy addition to the city's growing catalog. The record gets off to a fast start on its eponymous track, a three and a half minute bubblegum jam that typifies the ability of strong pop songs to transcend time. The tune's jangling stride and whoo-ooing never look back, tumbling forward towards a beach rock solo with interstellar aspirations. Surfy washes segue right into the rollicking lead guitar on "Burnout," a slightly filthier tune that walks the line between Buddy Holly and basement punk. The vocal work here is an echo-y celebration- the cool croon of a joyride to Make-Out Point. The mixing on "Burnout" is especially tight; the singer's voice never climbs over the instrumentation, but isn't obscured by it either. Proof that not every sound need be recorded through an empty Folger's can to make a solid garage rock tune. On "Cheetah High Heels" The Bingers shed the bubblegum, instead relying on needle solos and slanted riffs. The song melts down into semi-abrasive froth before being yanked back out by a piercing howl. The most surprising moment on Land Lobster is its last, the tender and balanced ballad "Young With You." Twinkling embellishments and a more nasal vocal swoon are grounded by instinctual drum work. That percussion holds serve through the track, rumbling when necessary and laying foundation for snug guitar licks that plead to be cuddled with. While "Land Lobster" is the clear gem of the record, it's "Young With You" that provides reason for excitement. 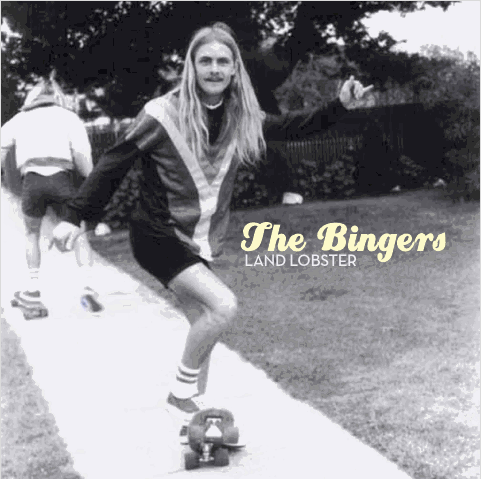 What we have in The Bingers is a band that knows how to throw a party and wants everyone to have a blast. That's the easy part. That they're already hinting at a maturity and range (on their first EP) that many garage rockers never attain suggests a bright (and groove-filled) future.